Wednesday at 1930 UTC (3:30 pm ET, 12:30 pm PT) SDO will perform a Delta-H maneuver. This is designed to keep the fine-guidance system within limits by using a series of short burns on the thrusters. Thursday we will do two more maneuvers. The EVE Field-of-View maneuver will start at 1315 UTC (9:15 am ET) and the HMI/AIA Flatfield at 1630 UTC (12:30 pm ET). Before, during, and after a maneuver SDO data may be unavailable. 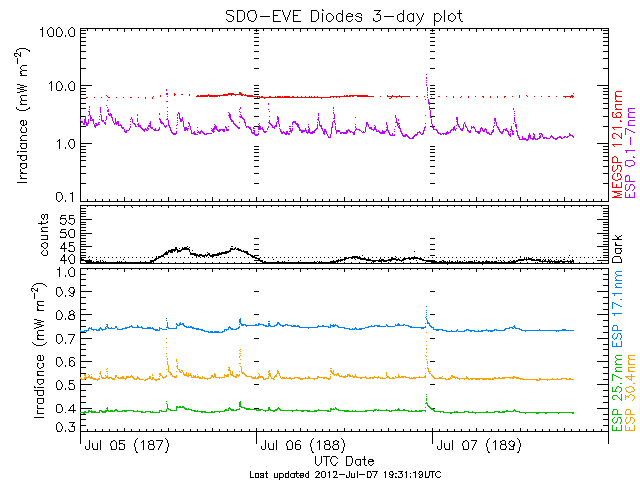 It has been a busy week for SDO. On Tuesday we did an EVE cruciform maneuver, where we point SDO back and forth and up and down to explore how EVE is working. At left is an AIA image taken during the cruciform. On Wednesday the Hi-C rocket lifted off from White Sands Missile Range (just over the mountains from the SDO ground station) and took high-resolution images of the Sun. I haven't seen any images yet, but I'm sure they will look great! With 2 X-class flares in 2 week it looks like the southern hemisphere is moving toward solar maximum! 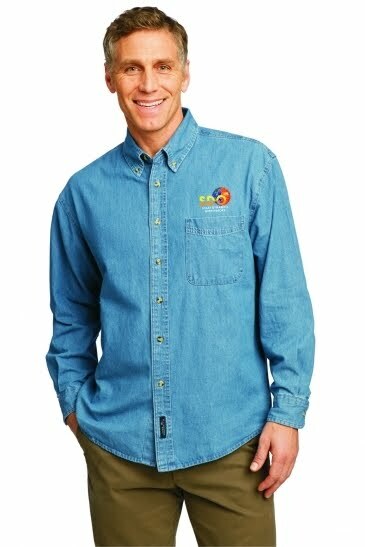 The SDO Apparel store has been temporarily re-opened. I'm not sure how long it will be open, so act quickly to purchase customized SDO shirts (see picture to left), caps, or backpacks. The store is a non-NASA website at http://sdo.eliteimagestore.com. Please pass the information along to any interested people. Thanks to Joe Gurman for installing the new RAID and moving the SDO website onto the new drives. The Sun is looking beautiful today! The GSFC SDO website is having a disk replaced and should be back online tomorrow. Many thanks to Joe and Joe for installing the new drives. Repairs at the SDO ground station in New Mexico also delayed delivery of data to the SOCs in Palo Alto and Boulder. Both systems are repaired and delivery of the science data has resumed. Of course, trouble with the data system means the Sun will do something interesting. 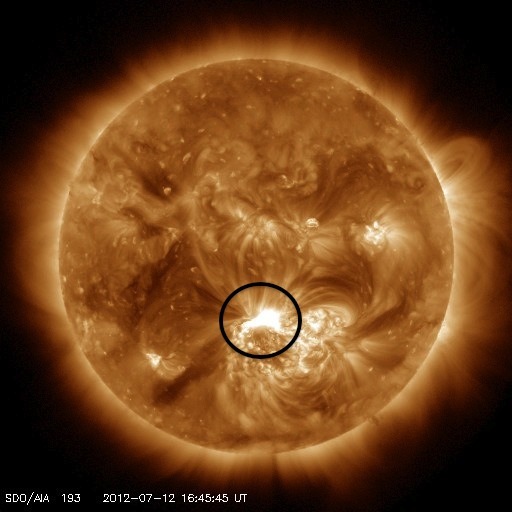 An X1.1 flare erupted late yesterday (UT, 7 pm ET). Here is the EVE irradiances showing a peak in the top frame at 2300 UTC. 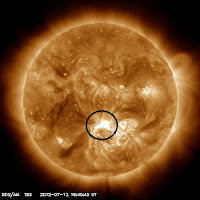 The flare was in AR 11515, very close to the receding limb of the Sun, and in the southern hemisphere. 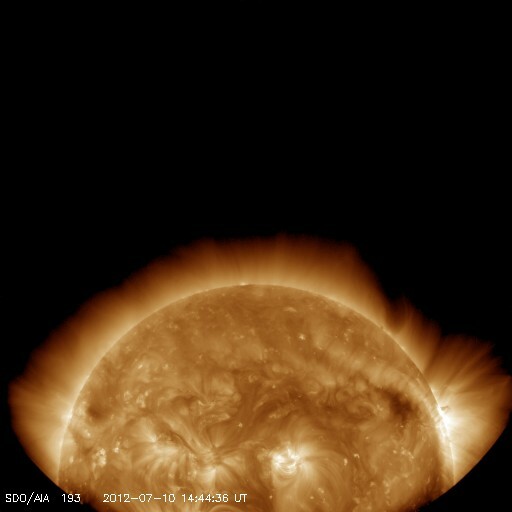 The SDO RAID is undergoing a disk scan at this time. The web server is offline and will be until the scan completes. We have a new RAID out of the box and configured, so it might be ready to go by tomorrow. With a little luck, we'll be able to rsync it with the old RAID and get things back to normal soon. 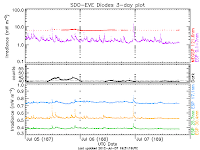 This is the Solar Dynamics Observatory Mission blog. It will consist of mission status, news, and event updates. Mercury Transit in 8 Days!